weekends and two evenings a week to make the room ‘safe’ for preschool children and their parents. Queer artist Jason Woodson, who had his painting covered-up says: “The purpose of the exhibition was to open up a dialogue with the broader community to increase both knowledge and understanding of LGBT issues. 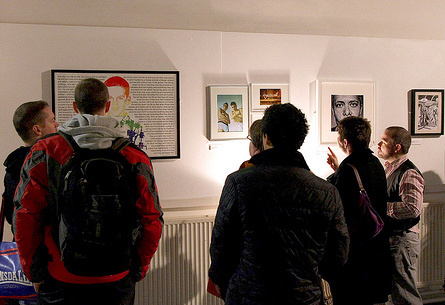 “GFEST – Gaywise FESTival is a showcase for LGBT / glbt or gay artworks, films and performances working in partnership with a range of London venues that help challenge preconceived notions and also among the hard to reach communities, which Hampstead Town Hall attracts. 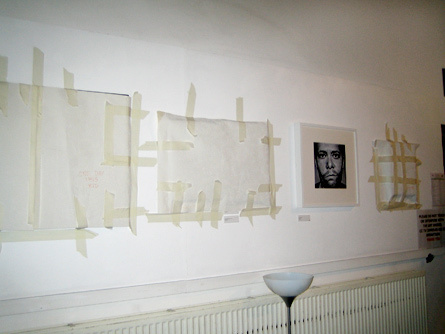 We opted for exhibiting the work as per the exhibition open times. This was also in the hope that the town hall management would reconsider their decision to cover the artworks on the evenings, which they didn’t and insisted on covering the artworks on the two weekdays evenings and weekends – post the official exhibition closing times. It was a no-win and very traumatic last minute decision, either to take down the exhibition or be forced to comply with their decision while also managing the rest of festival activities. Considering the lack of resources and recourse to an alternative venue, we opted for the latter and ensure that the exhibition goes ahead and viewers can make up their own mind whether the work warranted the censorship. We have written to Hampstead Town Hall Trustees / board of management to seek their official response but it feels as if they are ignoring us. It has been a good learning process for us but also historic mainstream arts & community venues like this need to face the issues in more balanced way. In 2010, initiatives like GFEST need to encouraged by more mainstream venues rather than inflict censorship. I (editor of Feminine Moments) am sorry for Wise Thoughts. They do a fine and huge job to present queer art. This cover-up sounds as a pure case of homophobia and harassment of a queer arts festival and I will soon post more reactions to the censorship. If you want to comment on this article, feel free to write your comments below.